How is MEP token different from other ICO Tokens? 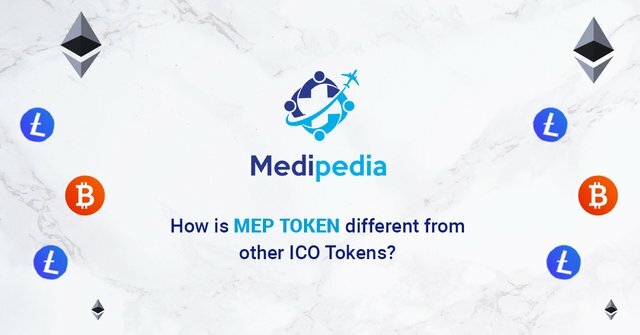 Medipedia token, or MEP token, is a cryptocurrency that has been designed to provide the users of the Medipedia platform with a secure and easy way to make payments of transactions and other fees. There is also a reward token system, called Medipedia Rewards (MPR), which aims to generalize the use of the platform for external users as well. Let’s find out more about MEP token and how it is different from other ICO tokens out there. Medipedia token is a type of utility cryptocurrency that gives tokenholders access to a blockchain-based healthcare system where they can find and connect with doctors online and consult with them about a treatment before actually meeting in person. The platform provides an interface for medical consumers to connect with reliable service providers according to their budget and requirements. MPR points are awarded to medical institutions based on their performance and reviews shared by patients. Reward points received by doctors within the platform can also be converted to MEP forms. Medipedia (MEP) token is an ETH token that can be transferred, under given conditions, and traded on a number of accepted exchanges. Medipedia Reward (MPR) are special tokens that are usable only within the platform. It is non-tradable and cannot be transferred outside of the platform. Medipedia tokens can be used for purchasing professional consultation tickets which can be used for payment of the consultation expenses within the Medipedia platform. That means you can pay for any kind of online and physical medical consultation conducted through the platform in MEP tokens. Transactions with Medipedia tokens are faster, resulting in timely medical help and treatment. Low latency ensures timely response within the platform. Unlike ETH or BTC, MEP tokens use Human Readable Account names which are not public. The users can send and receive tokens and even smart contracts via the same account name. Medipedia token (MEP) information is stored in a centralized storage. Another great thing about MEP tokens is that they can be moved out of the platform and used in other ERC20 applications, unlike many other utility tokens which are limited to specific applications. The token can be stored in any ERC20 compatible wallet and can be used on the platform to avail healthcare services and related transactions.